J. J. Bear is a little teddy bear with a big problem. The children who had loved him grew up, and they don't need him anymore. He has to find a new home, but how? As he peers over the rim of the cardboard box, he doesn't know where he is, but he knows it isn't home. Shortly after his arrival to this strange new place-which turns out to be a very busy factory warehouse-J. J. meets Charley, the company cat. 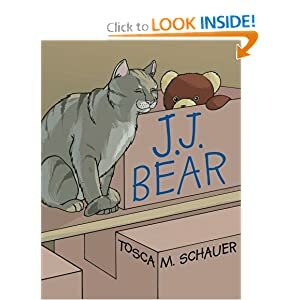 Charley is very good at his job-keeping critters out of the warehouse-and he teaches J. J. all about cats and what they do. He also does his best to help the teddy bear find a new family. After a fur-raising ride through the warehouse on a forklift, J. J. hopes that Charley can use his influence on the Boss of the factory to help J. J. Bear and the other toys find new homes and new children to love them. This was a great story about getting second chances and making friends in unlikely places. My daughter and I read this together and we both thought that it was a fun story for any family. With the number of teddy bears in our house I know how much love they can get, and it was heart-warming to see how this story brings together the love of one family and how things can change as children get older, but how circumstances can offer anyone second chances on life, and that you have to sometimes have a friend that will give you the push that you need to move you in the right direction. This was a great story that I would highly recommend!